"Within" is a beautiful collection of original songs! It's perfect for prayer, meditation, Bible study time, or listening enjoyment. 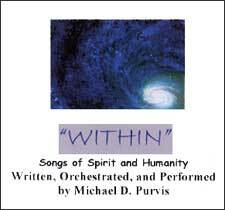 Written, orchestrated, and performed by Michael Purvis, this is a beautiful recording of original songs, many of which are on spiritual themes. Available soon in CD and cassette.